It appears that the digestion of Mira+YFP C2 (lane 7) did not work properly. This could have been the result of choosing a bacterial colony that was the result of contamination, or from simply an error in the digestion step. We then transformed the ligated plasmids into Turbo e. coli and plated the bacteria on Amp plates. Plates were left in the 37°C incubator overnight. 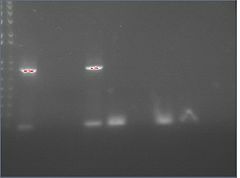 After receiving the new primers we performed PCR on barnase vectors PMT413 and PMT1002, LacIN, as well as the GAL4 DNA binding domain. The ladder is in lane 2, the GAL4 PCR products are in lanes 5 through 9, the barnase PMT413 lanes 10 through 14, and the LacIN PCR product is in the last 3 lanes. 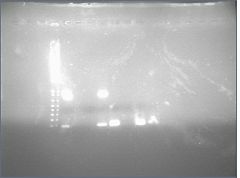 After PCR was confirmed successful, we decided to gel purify the LacIN because of the multiple band sizes seen in the gel. Below is the gel where LacIN was gel extracted, the chunk missing from the gel is where LacIN was identified to be. Gel extraction was performed according to the QIAgen gel extraction kit protocol using a microcentrifuge. Submited plasmids from each of the 7 Barstar colonies for sequencing. 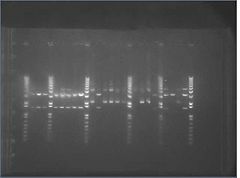 Gel of gradient PCR of the 741bp PDK intron out of pHANNIBAL and pKANNIBAL. Lanes are (left to right, temperatures are annealing temperatures used in the gradient PCR) 1kb+ ladder, pHAN 50ºC, pKAN 50ºC, pHAN 55ºC, pKAN 55ºC, pHAN 60ºC, pKAN 60ºC, pHAN 65ºC, pKAN 65ºC. It appears that pHANNIBAL worked at 50, 55ºC but pKANNIBAL didn't. This page was last edited on 26 September 2017, at 19:11.